EdX has its "MicroMasters" program. Now Coursera has introduced the "MasterTrack." The massive open online course provider recently announced that it will pilot three MasterTrack certificate programs in coming months: one at the University of Michigan and two others at the University of Illinois. The news came during Coursera's partners conference, hosted at Arizona State University. The idea: to parcel up degrees in small, more digestible chunks for prospective students. 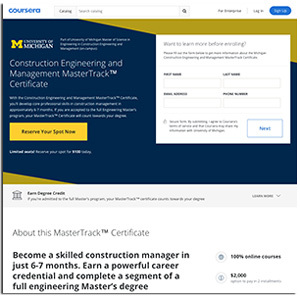 U Michigan's Construction Management MasterTrack will allow users to take courses for certification or apply their work to an advanced degree that would be completed on campus, if they meet admission criteria. The program costs $2,000, has a series of six courses and is expected to take about six months to finish. The institution hasn't finished figuring out how many credits would be applied from the MasterTrack credential to a master's degree, but according to an FAQ on the university website, the "expected reduction" would be about six credits. Compared to traditional distance learning tuition, that would be a savings of about $1,165 per credit hour. U Illinois' Digital Marketing MasterTrack features five courses, costs $3,474 and starts in mid-April and will be done in November. The program has four graduate-level courses plus a capstone course. The Instructional Design MasterTrack, also at Illinois, has two courses and costs $2,316. That one begins this fall. Whereas the university hasn't announced a tie to master's degrees for the digital marketing certificate, credits earned in the instructional design program could be applied to a master's degree. None of the courses in the MasterTrack pilot will be offered as true MOOC classes. All have a price tag attached to them. Classes include readings, videos, graded assignments, project completion and real-time classroom sessions by webinar. At the same time that Coursera introduced its MasterTracks, the organization also announced six new degrees from five schools in computer science, business and healthcare. MOOCs have increasingly become a "gateway" to online degrees, according to CEO Jeff Maggioncalda. As he noted in a recent Coursera blog article, more than half of degree students "took one of our partner's open online courses before applying to a degree program."